I just provided a detailed update on the current state of affairs in the ITC investigation of Apple's first complaint against HTC, and I saved a true gem for this separate blog post. It's a story that's remarkable per se -- allegedly, Android started at Apple -- and it could also have major legal implications for a future Apple lawsuit against Google or possibly even for Apple's dispute with Motorola Mobility after its proposed acquisition by Google. 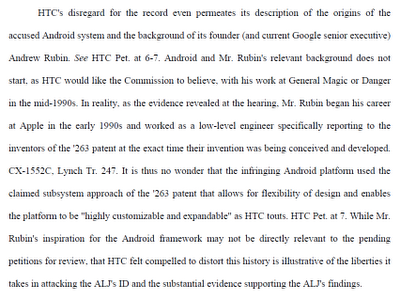 Android and Mr. Rubin's relevant background does not start, as HTC would like the Commission to believe, with his work at General Magic or Danger in the mid-1990s. In reality, as the evidence revealed at the hearing, Mr. Rubin began his career at Apple in the early 1990s and worked as a low-level engineer specifically reporting to the inventors of the '263 [realtime API] patent at the exact time their invention was being conceived and developed. [...] It is thus no wonder that the infringing Android platform used the claimed subsystem approach of the '263 patent that allows for flexibility of design and enables the platform to be "highly customizable and expandable" as HTC touts. 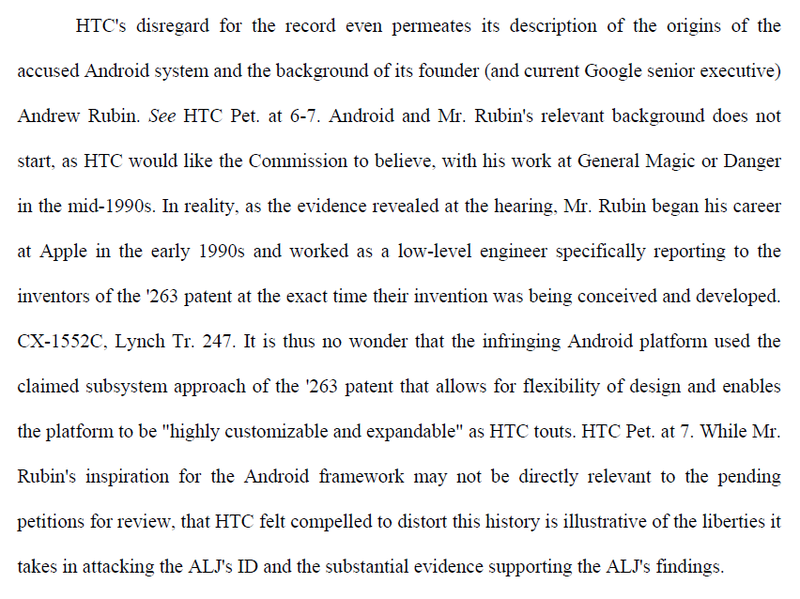 [...] While Mr. Rubin's inspiration for the Android framework may not be directly relevant to the pending petitions for review, that HTC felt compelled to distort this history is illustrative of the liberties it takes in attacking the ALJ's [initial determination] and the substantial evidence supporting the ALJ's findings. Look at the first two sentences again: "Android [...] does not start [...] at General Magic or Danger." According to this filing, it all started at Apple! This is really remarkable. Rubin worked at Apple long before the iPhone -- even long before the iPod. If Apple had just claimed without particularity that Android started at Apple, most people would dismiss such an allegation as complete nonsense. But Apple now asserts -- in a filing with the ITC, which means Apple has a legal obligation to make truthful representations of fact -- that Rubin's superiors at Apple were the inventors of that realtime API patent and he worked for them at the very time they made that invention. He worked as a low-level engineer while the inventors were senior people. It's possible that he then contributed to the implementation of the claimed invention. As Apple points out in the last sentence of the passage I quoted, this fact only comes up in order to show that HTC's representations weren't the whole truth as far as Rubin's background is concerned. HTC omitted a highly relevant fact. In another context, the ALJ accused HTC's lawyers of being "disingenuous". Apple doesn't say so but implies it. In legal terms, since Rubin never worked for HTC, this doesn't have nearly as much weight in the ITC investigation of HTC's Android-based products as it would have if Apple ever decided to sue Google itself. Should Apple at some point sue Google directly over this patent, this background could, however, have serious ramifications: Google (or a Google subsidiary like MMI) would almost certainly be found to infringe the relevant patent intentionally, and willful infringement would greatly increase Apple's chances of obtaining an injunction as well as triple damages. If Google is allowed to acquire Motorola Mobility (MMI), a company against which Apple also asserts the '263 patent (in a federal lawsuit), the situation would be a little more complicated because MMI's alleged infringement wasn't different from what HTC is doing: those are just Android OEMs who didn't develop Android itself. However, post-acquisition Apple could argue that Rubin works for MMI's parent company and could at least try to argue that willful infringement began at the latest when the acquisition was consummated. Failing all other options, Apple could always enforce the '263 patent against Google and thereby also prevent MMI from continued infringement whenever it's under Google's control. If the ITC upholds the initial determination that the '263 patent is valid and infringed by Android, Google should be very concerned. An ITC decision doesn't bind the federal courts, but the likelihood of Apple being able to enforce this patent -- and thereby have Andy Rubin declared a willful infringer of a patent developed at Apple while he worked there, by the very people he worked for -- would certainly be much greater than if the ITC decided differently. If Apple sought an injunction against Google, I'm sure Google would argue that this is anticompetitive. But competition law can trump patent law only under certain circumstances. If a former employee of a company is found by a court to have stolen a former employer's intellectual property, it's much less likely than otherwise that the right holder would be required to tolerate continued infringement. That email is only one of two emails that give rise to such suspicion. The other one is the so-called Lindholm email. I discussed the relevance of those two emails (Rubin's email quoted above and the Lindholm email) in this recent blog post. Since I wrote that post, there's been some more wrangling over the Lindholm document, but it now appears to have been definitively admitted as evidence. There was never a debate over the Rubin email anyway. The combination of the two is pretty damning for Google. But what's even more damning would be if Andy Rubin was ultimately found to have willfully infringed both Apple's and Oracle's intellectual property. That would be nothing short of shocking.